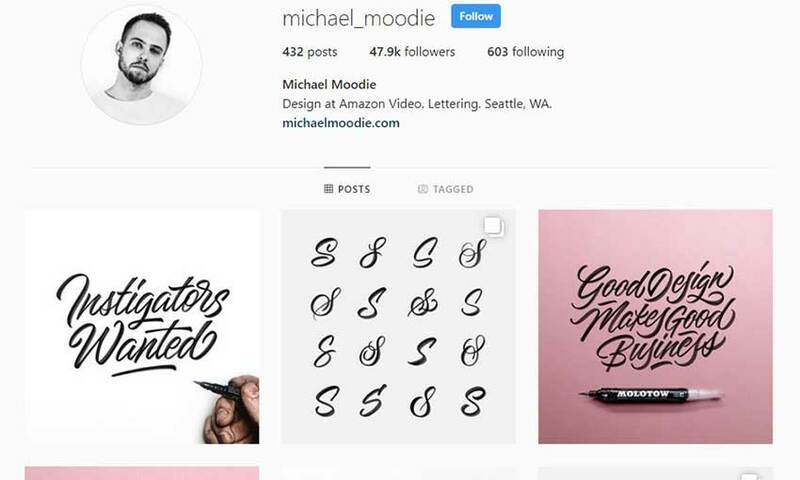 Instagram is chock full of lettering artists. These people put their awesome calligraphy out there for you to enjoy. You’ll find everything from traditional and digital lettering to graffiti, neon, and body art. If you’re looking for a little inspiration, give a follow to these great artists and watch your Instagram feed flood with beautiful artwork. All you can say when looking at these images: Wow! These designs are super cool and complicated. Letters, colors and unique designs mix together perfectly to create these fantastic pieces. This artist creates hand-lettering for weddings and home decor, and that sophisticated aesthetic permeates the whole gallery. You’ll find their work on everything from signs and cards to plates and book covers. This page is full of totally unique lettering designs, and there’s no one style here, either. Traditional, digital, grungy, sketchy, and elegant art awaits you. The artist also created letter brushes you can purchase for Procreate. Have you ever wanted to keep a cute journal filled with artwork and calligraphy? Look here for all the inspiration you’ll ever need! These pretty pastels are nothing less than breathtaking. This page is especially interesting because you’ll see both traditional art right on the paper and the artist’s work digitally overlaid on photography. The effect is pretty awesome! This artist specializes in clean script font, but you’ll see other types of lettering too. Bold letters that look like something off a poster, or painted words with bleeding ink – but all pulled off with the same stylish grace. This marker artist has a distinctively vibrant style. Mixed in you’ll find hand-lettering embroidery and digital pieces too, so there’s plenty of variety here! This artist is all about the atmosphere. Their black and white lettering and drawings are amazing, and you’ll also want to take note of the carefully arranged background! It all comes together to make the perfect image. Do you love watercolors and soft designs? Then you’ll definitely want to check out this artist! They make beautiful watercolor cards with calligraphy text. Have you ever seen prettier hand-made cards? You’ll definitely want to take a look at these cards with their artistic calligraphy and sweet designs. Do you love vintage lettering? This art looks like it could be engraved on a sign or as an established company’s logo. Absolutely gorgeous calligraphy. You’ll see a lot of sketches, soft gradients and shiny gold lettering here. You’ll love these watercolors with a unique font! There are plenty of distinctive and pretty designs here, all on cute little cards that will brighten up your day! Here’s an artist who’s got their colors down. The gradients they create within letters are absolutely stunning, and there’s not a bad mix of colors in this whole gallery. The backgrounds are super fun and well-crafted too! Not only is this artist a talented lettering artist, she’s also a best-selling children’s author. Her art is incredibly intricate and spans a wide variety of looks and genres. You’ll find anything from classic, homemade craft to modern styles within her gallery. This elegant hand-lettering looks like it could be on a greeting card. Scroll down to see a rainbow of colors and beautiful typography. These cursive designs just exude positivity. Maybe it’s the cute drawings or the splashes of bright colors. Either way, it’s impossible to be unhappy when you see this gallery. Add Some Creativity to Your feed! These awesome artists are sure to bring a little color and variety to your Instagram feed. If you find someone whose work speaks to you, make sure to like your favorite posts and give them a follow. Every artist could use a little love. And these fantastic hand-letterers definitely deserve it!